While 3D printing has most definitely blasted open a new world for designers and hobbyists, specific areas like cartography have received a real boon in progress. Because a map is all about being able to place yourself somewhere and visualize everything in a particular spot, it can be frustrating doing so only in 2D—requiring your mind to add the imaginary 3D element. With new technology, and especially 3D printing, mapmakers are now able to put geographies and locales into tangible form. While this is extremely helpful—and exciting—to the general layperson, imagine how incredibly useful such maps are to the visually impaired, truly taking some of the darkness out of traveling on foot. The technology of 3D printing is attractive for making communication tools for the visually impaired and blind, due to its obvious benefits in offering a raised surface that goes far beyond what Braille alone has to offer. While it’s amazing what we can do with digital design and 3D print, imagine the joy of being physically challenged and having new, easier—and even fun–ways to navigate the world. This all came together at the University of Central Missouri (UCM), with the added benefit of teaching students some new skills in technology and teamwork as they took on a comprehensive 3D printing and mapping project which evolved through working with peer and fellow student, Holly Carneal, who is blind. Carneal’s trusty guide dog, Stella, is there for her when it comes to getting around campus as a social work major. As helpful as Stella is, providing both companionship and safety, she can’t provide specific directions. With a mapmaking project looming close in Professor Jim Loch’s Introduction to Geology class this semester, a lightbulb went off as he thought of a great way to teach and help at the same time. His idea for a 3D printed campus map for Carneal and others also created an opportunity to bring together several different groups at the school for teamwork, which is always a crucial element in learning and preparing college students for jobs out in the real world. Loch reached out to a number of people as he began thinking of a brilliant and complex project that would not only keep his students very busy and challenged in learning a number of new things, but would also work to help Carneal and other blind and visually impaired individuals on campus, as well as visitors. “We had to figure out how to create the sidewalks that curve and replicate irregular angles and shapes,” Misener said, regarding the valuable learning experience afforded to all involved. Amazingly, for a team that was taking on a number of new skills as well as new technology, the project was completed in one month, with 50 hours of printing time involved. “It will not only help me get around better, but provide a valuable tool for any blind person visiting campus,” Carneal said. Carneal was able to offer suggestions that you wouldn’t think of perhaps unless actually experiencing the challenges of getting around campus—or any area—with visual impairment. “It was good to work on a real project for real customers with real deadlines. We had to develop our own resources and research the work of others,” Calon said. The map, now stored in the Office of Accessibility Services, can be used by their staff in assisting students and anyone in need of the tactile, 3D printed directions. We’ve reported on some other schools and entities creating 3D printed architecture and tactile maps in learning institutions and kiosks for the visually impaired. While many of these that are on public display are helpful to the blind, they are often helpful to everyone and offer a great opportunity to share the helpful benefits of 3D printing with the world. 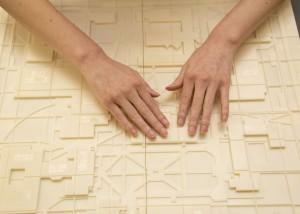 Have you been involved in 3D printing and cartography? How do you think this combination of technology and mapmaking can help the visually impaired further? Share with us in the 3D Printed Tactile Map of UCM Campus forum thread over at 3DPB.com.